Life lately has just been busy and crazy. I know I keep saying that, but it's true! It's not crazy in an unpleasant way but in such a way that no matter how many books I manage to squeeze in here and there, there doesn't seem to be time for writing about them. This bothers me because I find that if I do not write out my full thoughts on the books I read I tend to forget what the story was all about. 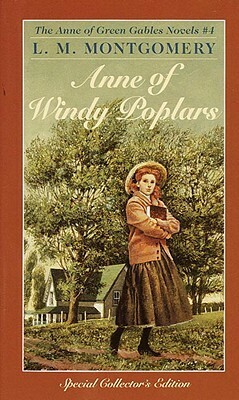 Take for example Anne, my long time friend, and literary favorite. Today I just wanted to take a few minutes to document the fact that I have been making progress on the Anne series. This past summer I started reading the Anne books again in preparation for our visit to Prince Edward Island back in June. I finished Anne of the Island as our plane was landing on the Island which was perfection itself, if I do say so myself. Looking back at the ol' blog though, it would appear that I never wrote up my thoughts on that re-read. I meant to. Oh well. I took Anne of Windy Poplars with me on our trip to England and read it over there. That and Robin Hood were my books of choice for that trip. (I've gotten halfway through Robin Hood but Anne was finished.) Again, I wrote nothing about the read, but moved along to Anne's House of Dreams . It's like a bad pattern or something! I've really been enjoying spending time with the adult Anne again. It's been awhile since that happened and there were so many characters and situations I had forgotten. It was lovely visiting with Captain Jim again, in particular. What a fine friend and admirable creature is he! It was fun to see Anne and Gilbert adjust to married life, although it did seem a bit idealistic. I'd forgotten that they decided to spend their honeymoon in their own house of dreams. Jonathan and I sort of did that too. We were scheduled to spend our honeymoon at a hotel on the Oregon coast but it was rainy and cold and rather miserable and so we decided to spend time at our new home which was much more relaxing and enjoyable. When you finally get to start your life together it's really nice to be able to do it in the place where you intend to actually live your life, I think. Plus there's just less pressure to live up to some romantic idea of what a perfect honeymoon might look like if you keep it low key. We're huge proponents of starting a marriage off "quietly" and then taking a trip after you've had time to adjust to and get to know one another a little better. This allows you to pick a vacation out together that suits you both much more than what society seems to expect of you. That's a side bunny trail, I do realize. (Heh.) Lots of people go off and have perfectly lovely, fun getaways. Ours just mirrored Anne and Gilbert's a little bit more closely and was idea for us at that time. It's also interesting to see Anne mature as an adult as she experiences more of life's sorrows and joys. Particularly in Anne's House of Dreams I enjoyed her interactions with the sad Leslie Moore. Leslie's life has consistently been one of immeasurable hardships while Anne's journey looks a bit different. Anne's life might have started out rough but it became more calm and joyful post-Green Gables. Anne has enough understanding of pain to be able to sympathize with Leslie but Leslie keeps Anne at bay because she resents Anne her present joys. It isn't until Anne experiences a deep sorrow of her own that Leslie feels like she can begin to relate to Anne. Isn't that just life? The relationship between these two young women totally epitomizes what we all do to one another. If we think another person has a more joy-filled existence than we do, we keep them at arm's length. If we think their problems are too big for us, we keep them at arm's length. If we don't want them to see our problems, we keep them at arm's length. We Christians (yes, let's get specific) have a terrible time obeying the verse that says we are to weep with those who weep and rejoice with those who rejoice. (Romans 12:15) We act like that's just a suggestion to us. But it is not; it's a command. Perhaps if we didn't spend all of our time avoiding that verse and instead focused on obeying it, we would have better relationships with one another. I know that the times I've made a conscious decision to set aside my feelings (which are transient) and focus instead on obeying that verse (which is a firm, unwavering command) I find I enjoy life with my brothers and sisters more. Also, I know the blessing of being a recipient of the supportive emotions of a friend even when I know it's a struggle for them to be happy and/or to weep with or for me. I know there have been times when it puts people out to rejoice with me, or to understand my weeping. But when another Christian takes the time to do that it's an immense and immeasurable blessing. Likewise, when Leslie and Anne finally got on board with each other's lives in a more holistic way, their friendship blossomed and bloomed. Theirs is a friendship that screams Romans 12:15 at me and I'd forgotten what a perfect illustration that they are to that. Ok, so maybe this isn't a normal review and mostly it's just a note to say that I read the above two titles. I guess this will have to work for now. I'll try not to be a broken record about this crazy stage of life. It's not all that crazy, it's mostly just an adjustment period. Eventually it will be normal and I'll quit saying "I don't have time to write this up!" I promise that I'm aware that I'm gathering perspective and just needing to figure out how to adjust my priorities. If you see a few sloppy, patchwork reviews in the meantime, at least you'll understand why. 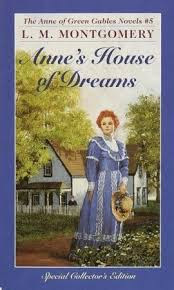 Anne's House of Dreams has always been one of my favorites of the series, probably second only to the very first Anne book.